During the summer of 2017, the community of Spokane, Washington was identified by CIRC’s Stakeholder Advisory Council as a potential partner for CIRC to work with on a Community Adaptation project. In late 2017 and early 2018, CIRC team members met with members of the Spokane community to kick off the Spokane Community Adaptation Project (SCAP). 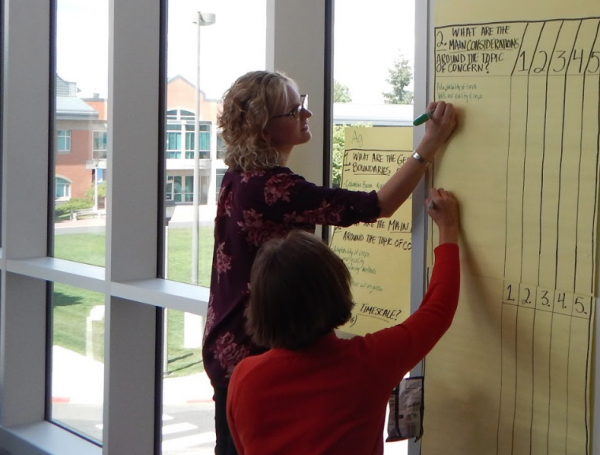 During these early meetings, Spokane community members identified climate impacts to the local watershed as their number one concern for the project to focus on. Why CIRC Community Adaptation & the Spokane Community? People in Spokane want planned action that leverages the science of climate impacts into practical adaptation actions that can be taken at the local level. Spokane is aligned with CIRC’s mission. Spokane meets CIRC's evaluation criteria of scalability, feasibility, and CIRCy-ness (a desire to transform knowledge into action). Groups and individuals in Spokane are excited to partner with CIRC and commit to a joint effort. Photo: CIRC team members and Spokane community members. May 21st,2018 meeting of the Spokane Community Adaptation Project. Ann Mooney, “Community Adaptation in Spokane, CIRC's new Community Adaptation Effort,"
Spokane community members are intentionally using water as a starting point for their Community Adaptation project with CIRC. The Spokane River, Spokane Valley-Rathdrum Prairie Aquifer, and water issues connected to them are central to the Spokane community. Working with the Spokane community, CIRC will develop science-backed adaptation tools and platforms to help manage climate impacts to the community of Spokane’s water resources. Photo: Spokane community members at the May 21st, 2018 meeting of the Spokane Community Adaptation Project. Water will be the starting point of this project. Water is not intended to be the project’s ending point. CIRC is open to exploring the implications of multiple climate impacts if the Spokane community expresses an interest in doing so. As part of our Community Adaptation efforts, CIRC team members meet regularly with our Pacific Northwest partners, engaging and collaborating with them to craft tailor-made climate adaptation strategies that empower communities to visualize and plan for the many changes they face in the future. We do this by combining our team’s climate and social science expertise with the local expertise, information, and concerns of our partners. We call this process coproduction.